Shufflebot - A robot that rests on part of its body during the recovery phase of its leg movement. Battle box – The fully enclosed safety shield that surrounds the arena. Robots may only expand from their size limit once they are in the arena, and only if the expansion is instigated by remote control (i.e. not just by being springy). 2d) For safety purposes, all weaponry must have the capability of being deactivated by remote control. 2e) Failsafe: in the absence of other transmitters, the robot weapon shall cease motion when the controlling transmitter is switched off. 2h) Weapons are not permitted to deliberately detach completely from the robot, but may be partially separated as long as it is connected by a tether of no more than 3 feet (914mm). The tether may not be used as an entanglement weapon. 2i) The botlets of a clusterbot must altogether meet the size and weight limits of the class in which they are competing (i.e. all three botlets of an antweight clusterbot must all fit in the same four inch cube at once), but if two fleaweights are competing as botlets of an antweight cluster then they must each conform to fleaweight size and weight restrictions. 2j) Robots must be clearly labeled with their names. A clusterbot must display the name of the cluster on all botlets. 2k) All sharp edges must have protective covers outside the arena. All protective covers are to be coloured red and made clearly visible. 2l) Batteries must not contain liquid acid, or electrolyte, or exceed a maximum of 24 volts. 2m) The following radio frequencies are acceptable: 27 MHz, 40 MHz, 418 MHz, 433-434 MHz, 868 MHz and 2.45 GHz. 4a) Battles will last for a maximum of three minutes. 4b) A robot that falls off the arena has lost. 4c) When any robot is immobile or lacks controlled motion then a judge will call cease and the driver will have ten seconds to demonstrate that control has been restored, otherwise the robot will have lost. 4d) At any time in a fight, a robot may surrender, if so they will have lost (The roboteer may shout stop). 4f) Outside manipulation is not permitted during the contest (they may be manipulated by a judge during a pause in the battle, as described in the previous rule). 4h) If a robot leaves the arena after the battle has started but before the robots have made contact then the judges shall decide if the battle is to be restarted. 5a) Contestants must register their frequencies (including which crystals they have) with the event organiser at least 7 days before the contest. 5b) There shall be 3 neutral judges identified before each battle and all shall have an equal vote. If a contestant has an objection to one or more of the judges then they shall make it clear before the match begins. The AWS committee will then decide if the complaint is valid. 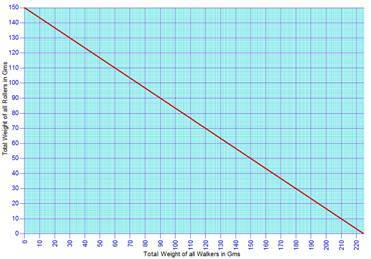 5d) Robots will be weighed by scales that are accurate to at least one gram (the weight limit (2a) is judged as the 'fighting weight' entering the arena). 5e) Before combat commences, each robot will be checked by the event organizer or their delegate to ensure that a minimum of the following rules are complied with before being allowed to compete: weight (2a), size (2b), power link/switch(2c), failsafe (2d), name (2i), sharp edges(2j). 5f) Contests must communicate in a socially acceptable way. 5g) A team may enter a maximum of four robots of which three may be rollers and one either a walker or a clusterbot. 5h) All teams must be self-contained in terms of driver, transmitter, robots and battery packs, i.e. these cannot be shared with another team. ii. The robots will be placed straight back into the arena, in their former starting positions, without repairs. 5j) After combat has ceased, only the driver or one of the designated officials may retrieve a robot from within the arena. The driver is responsible for ensuring that their robot is in a safe condition before retrieval takes place. If the robot has active weapons then it is essential that the weapon is made inactive before retrieval. 5k) A robot must be placed in the arena, ready to fight within five minutes of being called to fight by the event organiser (this is a maximum limit, contestants are encouraged to be ready to fight as soon as possible). Failure to be ready to fight within five minutes will mean the robot may be judged to have lost the fight.